U2, Aodhán Ó Ríordáin, and the Irish trying to save America. In autumn 2017, U2 released their 14th studio album, Songs of Experience. Critical reception on the album was mixed – was it a superstar older rock band’s attempt at political relevance, or a late-career classic infused with the urgency of Brexit, Trump, and a world thrown into uncertainty? In December 2017, the band offered up a dynamic, uncomfortable performance as answer – giving Irish Americans much to contemplate in the current political age as to what activism can look like in specifically Irish and Irish American contexts. On December 2, the band performed their newly-released song “American Soul” on Saturday Night Live. Having collaborated on the album track with the socially conscious American hip-hop genius of the moment, Kendrick Lamar, they burst forth with a powerful activist performance that harkened back to their 1970s Dublin punk roots and took an unabashedly pro-immigrant stance. 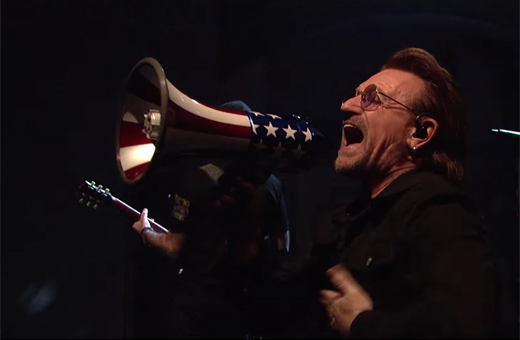 On this night, Bono sang live from New York of sanctuary and “refuge-Jesus” – pointedly doing so against an aggressive backdrop of Occupy imagery. At a time when eyebrows have been raised and think pieces penned as to why so many notably Irish American names have chosen to ally themselves at the highest levels of government and media, such a performance – in its lyrics, aesthetics, and urgency of message – stands to remind of an Irish American tradition that owes far more to a James Connolly than a Steve Bannon. With this instantly memorable moment, the band validated and indeed joined the ranks of current American activism – and did so by harkening back to the long historical tradition of the politically active and agitating Irish in America. The performance also added to a continuum of important Irish voices in the recent American political turn of events that began with Irish senator Aodhán Ó Ríordáin. In late 2016, Ó Ríordáin came to international viral recognition for a courageous speech about the new American path to a shell-shocked world. Since the speech, Ó Ríordáin has continued this transatlantic activism via the grassroots organization Irish Stand. The group showcases a powerful thread between Irish and American politics via pro-immigrant and anti-xenophobic campaigns carried out in the last year in both Dublin and New York City, while at times enlisting celebrities to raise the profile of their cause. With both his initial speech and ongoing New York activist mobilization, Ó Ríordáin sits in a tradition of international Irish oratory stretching back not only to Connolly and 1916, but to 1848 and 1798. Similarly, Irish Stand’s position on standing up for civil rights and laborers on both sides of the Atlantic falls firmly within the Connolly tradition – as the man famously honed much of his social and activist organizing back in Ireland after living in the U.S. from 1903 to 1910. As a biographer wrote of Connolly, “He had gone away from Ireland a propagandist; he was returning a leader of men.” Connolly is a reminder in our current times that political and activist exchange between Ireland and the U.S. has always been, as Glucksman Ireland House curator Daphne Dyer Wolf has put it, “fluid and interactive” – running both ways, with the politics and personalities of both countries influencing one another. Kerry McElroy is an Irish American freelance writer and Ph.D. candidate living in Montreal.